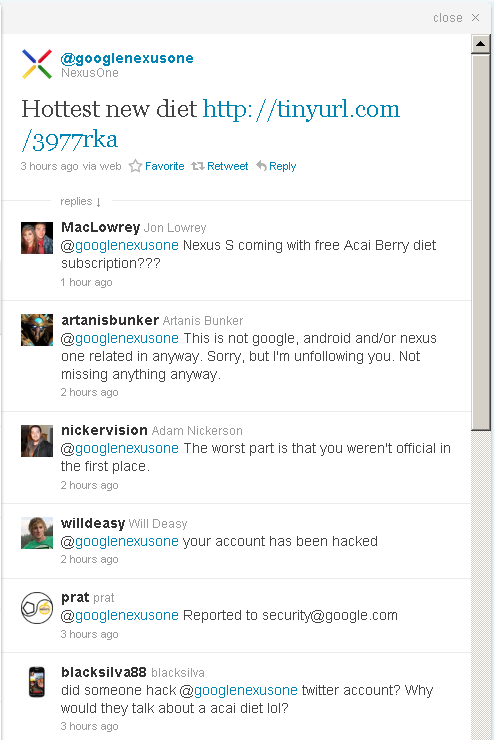 Sharing My Opinion: Google's Nexus One twitter account hacked? 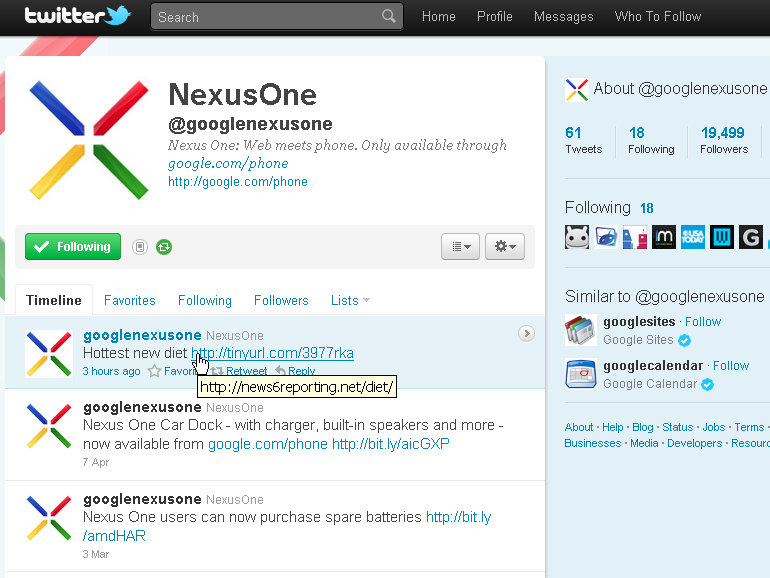 Google's Nexus One twitter account hacked? After several months without a tweet, the normally quiet, reserved, almost shy twitter account @googlenexusone decided to let one rip... and man, what a stinker. Being a Nexus One owner, I was glad to see the account tweeting again and was eager to find out what goodies/updates/announcements were being unleashed on N1 owners. Apart from a link, the only other clue to what the announcement was about was the tweet itself... "Hottest new diet". Strangely enough the first thing that came to mind was Gingerbread... Awesome! I thought as I proceeded to click on the link. I hesitated for a second when I noticed TinyURL was being used as the URL shortening service instead of Google's own "goo.gl", that second was long enough for the destination URL to be exposed. Even though "news6reporting.net/diet/" did not sound like a domain Google would own, let alone use to promote something about the Nexus One, I thought to myself, "stranger things have happened" and clicked on the link. * or any other use that is illegal. Bummed, and still unsure whether TinyURL had got it right (False positive maybe?) 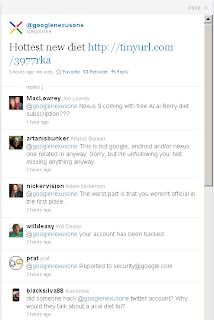 I was also curious to see (if it was spam), what sort of spam @googlenexusone was tweeting. So proceeding with caution, I armed myself with Rex Swain's HTTP Viewer to reveal what the page contained. (just in case it also contained malware). It was revealed that news6reporting.net/diet/ is indeed spam. 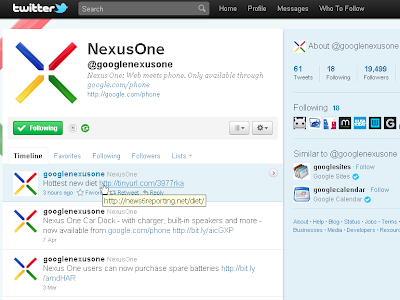 So, was Google's Nexus One twitter account hacked?, or was it not theirs to begin with? I actually thought that it used to be a verified account, but doesn't seem to be now. Seems as though whoever is in charge of the account has got it sorted (for now).